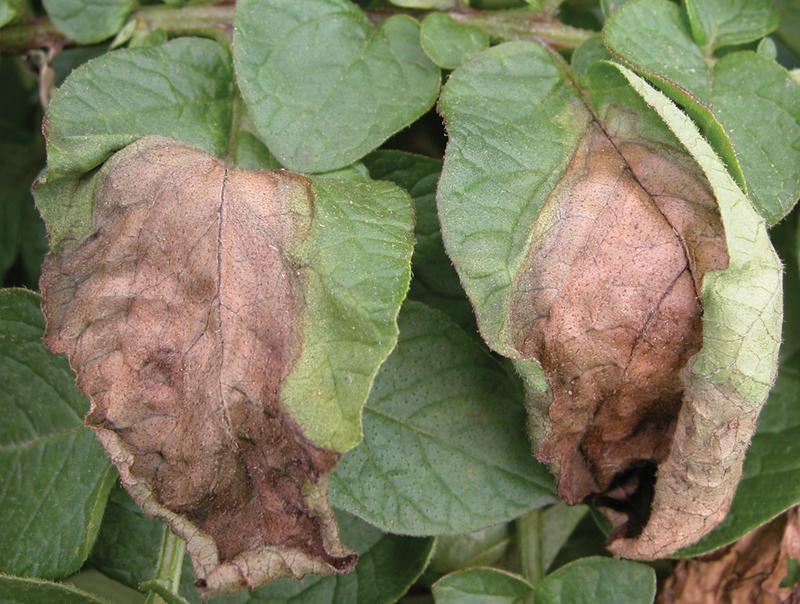 Late blight has been confirmed on potatoes near Alliston. Late blight has also been recently identified in Michigan, Wisconsin and New York. Michigan and Wisconsin has identified the strain as US-23. It is likely that the Ontario sample is the same but the sample has been sent to AAFC Lethbridge to confirm. The US-23 strain is susceptible to Ridomil (metalaxyl). Many fields are nearing the end but action should be taken to prevent tuber infections, especially in later fields. Continue to scout your potato and tomato fields and know the symptoms. See the Tomato Late Blight Photo Gallery and refer to Late Blight Look-Alikes for photos of late blight and possible look-alikes on tomato. See the late blight post from June 28, 2017 for fungicide recommendations for tomatoes in Ontario.